There is increasing pressure on doctor visits in our health care system. Doctors feel compelled to see more and more patients in the course of a day. A profit-driven system limits the amount of time with each patient. Appointments are shorter and shorter, as more patients are seen in a day. Many people feel dissatisfied with their experience with their doctor, and their own health can suffer for it -- even when they have regular doctor visits. In addition to the time constraints, other factors taint the quality of doctor patient communication. Doctors speak a language that is not common for people every day. Your parents have probably experienced the numerous health professionals talking to each other, and the patient, your aging parent, can feel left out of the equation. It's hard for patients to feel comfortable asking to clarify terms that don't make sense, or to question treatment options that they can't even spell. Improving the doctor visit is a key to improving their health. Yet, studies have shown that improved patient satisfaction with doctor visits can actually lead to better health. People will take medications more effectively when they are clear about the directions. 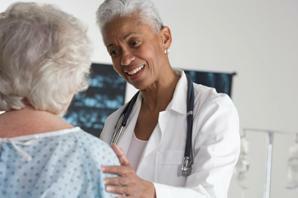 Patients heal faster when they believe they have had an active part in the decision-making. Doctor visits can be more accurate, and faster diagnoses can happen when people are not hesitant to share all their symptoms. And many medical mistakes can be prevented in doctor visits. To this end, The Joint Commission has established a public campaign to improve doctor visits by improving doctor patient communication. The Joint Commission is a national organization that sets standards for patient safety in hospitals, nursing homes, and doctor visits, and then verifies that the different institutions are meeting those standards in a process called accreditation. They believe that when patients are empowered to be active partners in doctor visits and throughout all of their care, the whole health care system will be more effective. The Speak Up campaign lets people in a variety of health care settings have a sense of why they should be proactive and talk to their doctors and other health professionals. It also gives guidance on what to talk about. They provide a number of free pamphlets that can be downloaded to take with you to doctor visits. These booklets address the conversations that people should have in different health care settings. The basics of how people should advocate for themselves in each health care setting are the same. The principals for actively managing your care are essential for a routine doctor visit in the office or hospital or nursing home. Because the The Joint Commission has no restrictions on copyrights for this information, I can share the basics with you. I urge you to use it to help prep your aging parents for all future doctor visits. Your health is very important. Do not worry about being embarrassed if you don't understand something that your doctor, nurse, or other health care professional tells you. If you don't understand because you speak another language, ask for someone who speaks your language. You have the right to get free help from someone who speaks your language. Don't be afraid to ask about safety. If you're having surgery, ask the doctor to mark the area that is to be operated on. Don't be afraid to tell the nurse or the doctor if you are about to get the wrong medicine. Don't be afraid to tell a health care professional if you think he or she has confused you with another patient. Tell your nurse or doctor if something doesn't seem right. Expect health care workers to introduce themselves. Look for their identification (ID) badges. Notice whether your caregivers have washed their hands. Hand washing is the most important way to prevent infections. Don't be afraid to remind a doctor or nurse to do this. Know what time of the day you normally get medicine. If you don't get it, tell your nurse or doctor. Make sure your nurse or doctor checks your ID. Make sure he or she checks your wristband and asks name before he or she gives you your medicine or treatment. Educate yourself about your illness. Learn about the medical test you get, and your treatment plan. Look for information about your condition. Good places to get that information are from your doctor, your library,respected websites and support groups. Read all medical forms and make sure you understand them before you sign anything. If you don't understand, ask your doctor or nurse to explain them. Ask a trusted family member of friend to be your advocate (advisor or supporter). You advocate can also help remember answers to questions you have asked. He or she can speak up for you when you cannot speak up for yourself. Make sure your advocate understands the type of care you will need when you get home. Your advocate should know what to look for if you condition is getting worse. He or she should also know who to call for help. If you do not recognize a medicine, double-check that it is for you. Ask about medicines that you are to take by mouth before you swallow them. Read the contents of the bags of intravenous (IV) fluids. If you're not well enough to do this, ask your advocate to do it. Make sure you can read the handwriting on prescriptions written by your doctor. If you can't read it, the pharmacist may not be able to either. Ask somebody at the doctor's office to print the prescription, if necessary. Carry an up-to-date list of the medicines you are taking in your purse or wallet. Write down how much you take and when you take it. God over the list with your doctor and other caregivers. Ask about the health care organization's experience in taking care of people with your type of illness. How often do they perform the procedure you need? What special care do they provide to help patients get well? Go to Quality Check at www.qualitycheck.org to find out whether your hospital or other health care organization is "accredited". Accredited means that the hospital or health care organization works by rules that make sure that patient safety and quality standards are followed. Don't be afraid to ask for a second opinion. If you are unsure about the best treatment for your illness, talk with one or two additional doctors. The more information you have about all kinds of treatment available to you, the better you will feel about the decisions made. Talk to your parents about their health care needs. Medical specialists could help enhance your senior parents' quality of life, if you understand how the system works.